Visiting Chinese President Xi Jinping Thursday met with Indian Vice President Mamid Ansari, also chairman of the Rajya Sabha (the Upper House of Parliament). Xi said that leaders of the two countries have a consensus that the bilateral relations are of highly strategic significance, and the bilateral cooperation will exert a far-reaching impact on the two countries, the region and the world at large. The two sides should adhere to the Five Principles of Peaceful Coexistence, expand cooperation, properly handle differences and accumulate positive energies for the bilateral relations, he said. The president said that the two sides should fully implement the agreements reached during his state visit by developing railway infrastructure and building industrial parks in India, encouraging more Chinese businesses to invest in India, promoting cultural exchanges and deepening the friendly feelings between the two peoples. 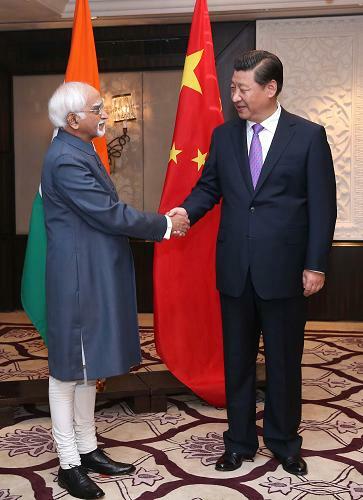 Ansari said that President Xi's visit achieved positive and important results and opened up a new chapter for the bilateral ties. China and India should enhance mutual trust, develop good-neighborly and friendly relationship, strengthen cooperation and forging ahead hand in hand, he said. Also Thursday, Xi met with Indian Minister of External Affairs, Sushma Swaraj. India is the last stop of Xi's four-nation tour in Central and South Asia, which has already taken him to Tajikistan, the Maldives and Sri Lanka. In Tajikistan, he also attended a summit of the Shanghai Cooperation Organization.